Training for firefighters is of utmost importance because while they're saving lives, they're risking their own. Firefighters need to know the safest, most effective way to handle a situation, and train and train and train in those situations so it becomes second nature when they only have a split second to make a decision. That's why we love the above quote, and we love the Forcible Entry Simulator. It was a product that was designed specifically to train firefighters safely, efficiently, yet to be as realistic as possible. It's capable of resetting in seconds to be practiced over and over again, which means it's a great training tool to train large groups of firefighters fast. "Unfortunately, forcible entry training is hard to do without destroying someones door. We purchased this prop so that we can train our firefighters on all aspects of forcible entry. If you don't know what you are doing, a door can make you look like a fool very easily. Now with this prop, our firefighters are able to train on forcing doors, windows and window bars without any additional cost. The units is resettable and does not require dowels or wood. I highly recommend this unit and would promote it to anyone interested in purchasing it." 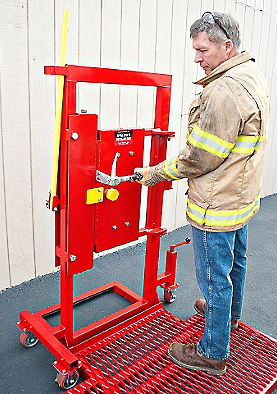 To order one of these Forcible Entry Simulators for your department training, go to our website.